Get that indoor feeling in your own backyard without having to give in to a casual style with the deep seat comfort and timeless beauty of this outdoor arm chair. With a sturdy aluminum frame, the wide proportions and ideal back height will keep you comfortable for hours on end while still providing the support your body needs. It is completed with a hand-applied durable finish to ensure it will withstand the rigors of the outdoor elements. The Ravello Relax Plus Traditional Outdoor Arm Chair by Tropitone at Malouf Furniture Co. in the Foley, Mobile, Fairhope, Daphne, and Gulf Shores, AL area. Product availability may vary. Contact us for the most current availability on this product. Maintenance Fabric: Clean all spills promptly. Fabric life can be extended by simply rinsing down the patio furniture regularly with water. Certain suntan and sun block products may permanently discolor any fabric. This possibility can be minimized by immediately cleaning after contact. In addition, storing the cushions when not in use will extend cushion life. 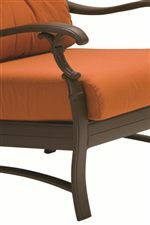 Enjoy the outdoors a little bit more this summer with the comfort and style of the Ravello Relax Plus collection. With a variety of outdoor seating available, this collection will add a splash of elegance with its subtle curves and traditional-styled frames that are featured throughout the pieces. All pieces are sure to last through the years featuring weather tested fabrics and powder-coated aluminum frames. The Ravello Relax Plus collection is a great option if you are looking for Casual Outdoor Furniture in the Foley, Mobile, Fairhope, Daphne, and Gulf Shores, AL area. Browse other items in the Ravello Relax Plus collection from Malouf Furniture Co. in the Foley, Mobile, Fairhope, Daphne, and Gulf Shores, AL area.